For a small eatery, Thai Avenue Restaurant serves up some mighty big flavor. The fare is clearly fresh and freshly made — no wonder the flavors are so bold. The South Whitehall Township restaurant opened in quarters formerly home to a burrito restaurant in a shopping center on Tilghman Street about four months ago. It's a far cry from the eatery's previous Southwestern-themed decor to the understated, sophisticated elegance of its current incarnation. Brown and terra cotta walls play off a black ceiling; black tables, chairs and banquettes keep the ambience sleek and focused. Except for a lavish, huge floral arrangement in a regal bronze vase, the restaurant is bare, and that minimalism works well here by keeping the focus on the food. This topnotch Thai cuisine is worthy of focus. Soups, salads, fried rice, curry dishes and stir-fry entrees are featured, along with noodle combinations, seafood dishes and a number of different duck preparations. 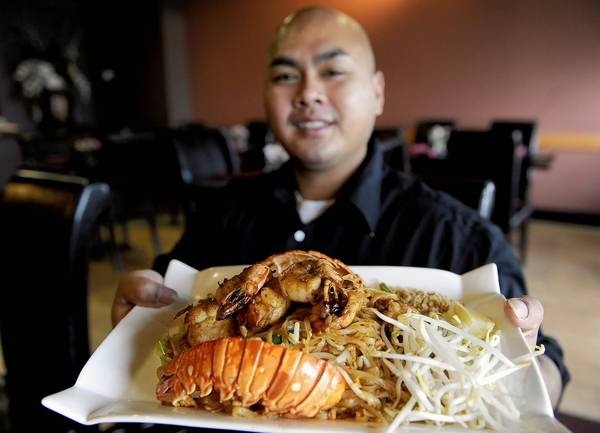 Nearly a dozen chef specials, however, show the restaurant's breadth and innovation: For example, lobster pad Thai includes eight ounces of lobster and jumbo shrimp, too; emerald salmon features green peas, avocado, bell peppers, basil leaves and green curry sauce with the pan-seared filet. Succulent Thai dumplings ($6.99) were stellar, their fragile, steamed wonton wrappers complemented by the tender, delicate stuffing — crabmeat, ground pork, chicken, shrimp and water chestnut. Rich and deep, deep sweet black soy sauce finished the dumplings with perfect counterpoint. It's hard to imagine a rendition of somtum salad ($8.99) better than the one I enjoyed here. Shredded green papaya, carrots and green beans were fresh and delightfully crisp, the shrimp was tender and tasty and tomatoes, peanuts, chilies and lime juice brought all the elements together with zip and zest. What I remember most about "khing sod," a stir-fry entree ($12.99), is ginger. That crystal clear flavor permeated pieces of beef sauteed with mushroom, onion, scallion, bell pepper, celery and black bean sauce. Excellent. "Tuna panang avocado" ($19.99), from the chef specials list, was an adventure in flavor. Topped with sliced avocado, pan-seared tuna steak was cloaked in spicy panang curry sauce with bell peppers, kaffir lime leaves, ground peanuts and coconut milk. The velvety, buttery avocado was brilliant foil to the sauce's spice. Sticky rice with coconut ice cream ($6.99), made in-house, cooled and calmed dinner's bright and bold sensibilities. It was, indeed, a perfect ending to a taste extravaganza. There are so many dishes I want to try here — honey duck (half boneless crispy roast duck with carrots, green peas, cashews and homemade honey sauce) for one — that I am counting the days until my return. Dinner for two, including tax and tip, totaled $75.